Wednesday night's GOP presidential debate on CNBC—in which the moderators got more attention than the candidates—was watched by 14 million people. While that's a record audience for CNBC, it's significantly lower than the 24 million viewers who watched the first Republican debate on Fox News in August and the 23.1 million who tuned in to CNN for the second debate last month. The Oct. 13 Democratic presidential debate, which also aired on CNN, was watched by 15.3 million. 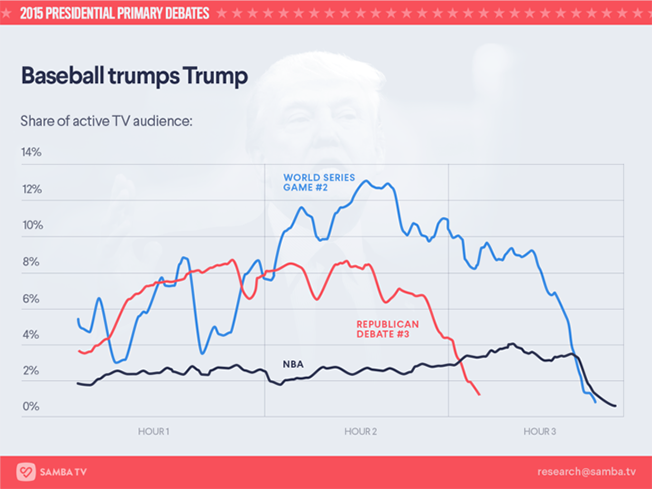 In addition to pulling in smaller numbers than the two previous GOP debates, viewers stayed tuned in to Wednesday night's showdown for the shortest amount of time, according to data from Samba TV, the social TV analytics platform. 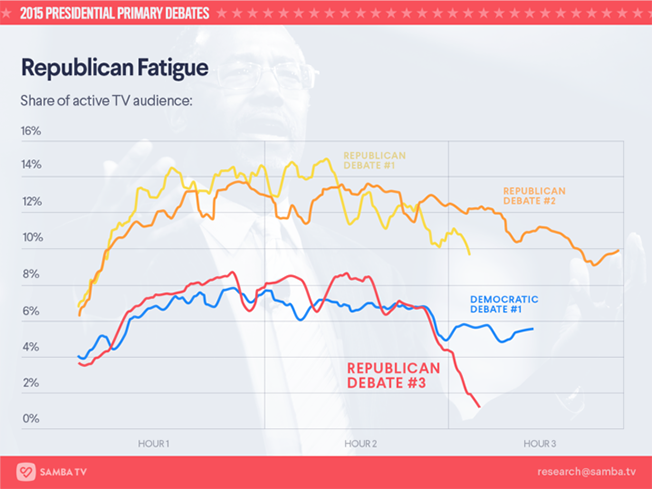 Samba tracked debate viewership over five-minute intervals and found that the average viewer watched only 60 minutes of the debate, compared with 71 minutes for the first debate, which was also two hours. 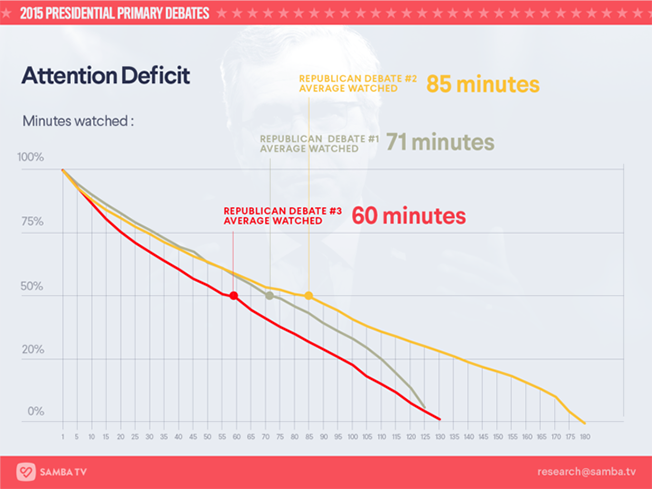 The three-hour second debate was viewed for an average of 85 minutes. 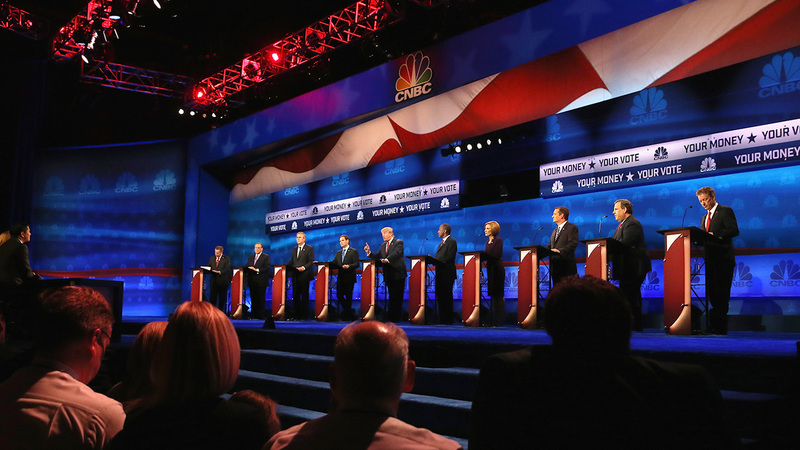 The CNBC debate only attracted 31 percent of viewers who had previously watched the earlier Republican debates. 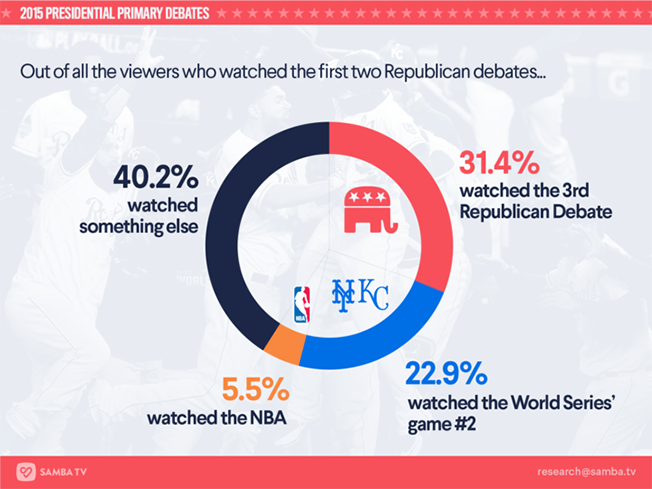 As for the rest of the first- and second-debate audience, almost 23 percent watched Game 2 of the World Series on Fox, 5.5 percent watched an NBA game and 40 percent chose other TV options. 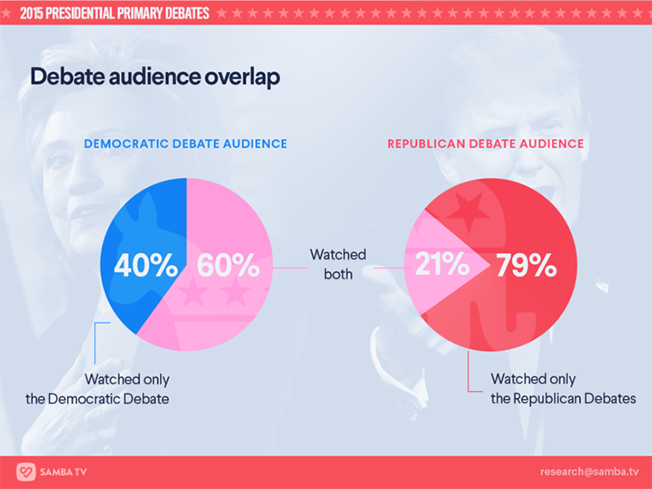 As a result, the share of active viewership was significantly below the first two GOP debates and was more in line with the Democratic debate. The CNBC debate lost viewer share to both the World Series and the NBA's second night of games. Samba also found that while three-fifths of Democrats who watched the Democratic debate also tuned in for at least one of the three Republican debates, their GOP counterparts weren't nearly as eager to check out the other side. Just one-fifth of Republicans who watched at least one GOP debate also watched the Democratic debate. The next GOP debate will air Nov. 10 on Fox Business Network. The Democrats will face off again on Nov. 14 on CBS.